It’s not a dog-eat-dog world out there, though predators fight other predators all the time. It’s more like a crocodile-eat-shark world out there, as this awesome image taken in Australia attests to. In the poorly-named Alligator River in the hilariously-named Kakadu National Park in Australia’s wild Northern Territory, a wildlife photographer caught this awesome photo of nature’s fury in action as the greatest predator of the seas gets bested by the greatest predator of fresh water. 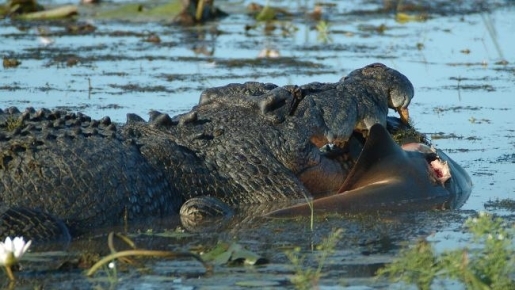 Score one for the scaled, as crocodile beats (and eats) shark!